When customers or clients complain to an organisation they expect a response. Failure to receive an adequate reply often convinces them that their complaints were not just oversights or mistakes but rather indicative of the kind of company they are dealing with. Do not let the opportunity to rectify a complaint go to waste because you are unsure of how to respond. Instead, determine the type of apology you would like to communicate as well as the response you would like to make to the specific complaint. Consider too if you would like to extend any offers or incentives to the dissatisfied party. Format your response formally so as to communicate with your customers that you take their concerns seriously. Most customers who have an unsatisfactory experience with a product, service or company are first and foremost interested in having someone listen to their concerns and apologise for their experiences. Begin any response to a customer complaint by acknowledging the unfortunate experience and apologising for it. This does not mean you must accept the customer’s version of events if you do not believe they are correct, but you could acknowledge how the customer feels and apologise for the fact that (s)he felt (s)he had a substandard experience. If you do not believe your goods, services or company were directly at fault for this experience then do not include this message in your letter. Thanking the customer for bringing the issue to your attention. Informing the customer that his or her complaint has been appropriately logged. Assuring the customer that you are investigating his or her complaint. Asking the customer to relay any further information they have about the experience. Requesting suggestions for how similar experiences could be avoided in the future. Offering the customer a future interaction (discount, incentive, etc) with your company. Offering customers a way to stay in touch with your company is essentially a way of extending a second chance to the customer so that you can impress them and win back their loyalty. Many companies do this by extending special offers such as discounts, free consultations or even free gifts so that the customer can give a good or service another go. Companies may also provide incentives for customers to try again, such as points toward a larger goal or an extended subscription to ensure a future relationship. Companies which do decide to make such offers must be sure to provide them in a uniform manner, however, so that customers don’t feel as though others received more than they did and new complaints are created. A letter of apology following a customer complaint must be formatted as a formal business letter so that customers understand that the company is taking their complaints seriously. Such letters should include the name, title and mailing address of both the writer and recipient as well as the date of writing. Formal salutations and closing should be used. Any enclosures or attachments should be noted. 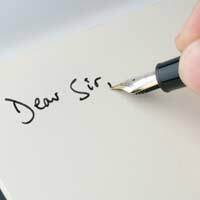 The writer should sign the letter as well as include a typed name. A clear font should be used and the size should be easy to read. These letters should be printed on company letterhead and delivered via post. Thank you for bringing you recent trip to Toy Train Town, and our lack of stock of the new Super Powerful Electronic Toy Train, to my attention. I apologise on behalf of Toy Train Town for not meeting your high expectations regarding the availability of this new product. Our Customer Relations department has noted your suggestion that we begin a waiting list to alert interested parties when new stock becomes available. We certainly see the value of such communication and hope to include such news in our electronic newsletter which will commence in the upcoming weeks. You and all other valued Toy Train Town customers will be able to subscribe to this free service either via our website or in store on your next trip to Town. In order to alleviate some of your disappointment on this matter, please accept the enclosed 10% off coupon to be used on your next purchase. We look forward to serving you again very soon.